Almost all of my poetry and poetry like stuff is (or was) posted on facebook under the name Zacht-Hart (soft heartedness). 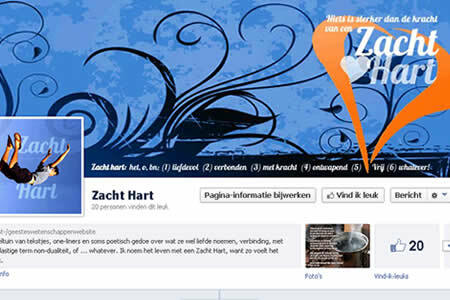 The Zacht Hart page is partly Dutch and partly English without translations. Sometimes the words seem to find their way in English and sometimes in my native language. This is blog used to be about about life from a non-dual perspective. Questioning stuff that appears to be real. But yes, a nondual perspective is still in the midst of duality. Even no-thing becomes a thing when it is captured with words. Therefore unfindable.me is nothing but a joke pointing to nothing. When concepts are transparent and meaning is unfindable all we are left with is experience. For now I don't know if the blog will continue or not. I only know if writing and posting takes place when it takes place. We only really know what happens now, and even that might be fantasy.